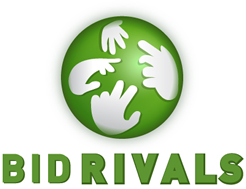 Bid Rivals (www.BidRivals.com) launched in 2009, before many of the other penny auction sites debuted. Their first auction was for a Nintendo Wii, which ultimately sold for $5.15. Current Bonus / Promotion for our readers Grab 25 Free Bids With Special Code “FREE25”The site has since become one of the largest penny auction sites in the industry, hosting global auctions with more than 1 million registered users. This huge user base has made it possible for them to offer high-end products from brand name companies. One especially notable feature is a “buy now” option, which accompanies every auction hosted by BidRivals.com. They are safe, trustworthy, and have built a top-notch track record. There is nothing to suggest that BidRivals Penny Auction is a scam. In fact, they are widely known throughout the penny auction industry as being dependable and honest, with a well-earned reputation for transparency. You can verify this yourself by taking a look at the reviews and ratings below offered by real bidders. Occasionally, people will point to some of the industry’stop penny auction sites, and claim they were ripped off. In most cases, however, this is due to a misunderstanding about how penny auction sites work. You pay for each bid, regardless of whether you win the auction. A lot of folks think they’ll receive a refund for their bids if they fail to win. In reality, penny auction sites have never worked this way. You can lose money if you bid for an item, and end up losing the auction. So, how can BidRivals offer products with high retail values for low auction prices? Again, this is possible because of the way PA sites work. For example, an auction might attract 1,500 bids at $1 a bid for an Apple iPad. Even if the iPad sells at the close of the auction for only $40, Bid Rivals has already made their profit by selling the bids. Are there dishonest penny auction sites out there that should be avoided? Absolutely. This is one of the reasons we started this site. In fact, we maintain a page listing safe penny auction sites so you’ll know where to start. Bid Rivals happens to be one of the safest and best-regarded penny auction sites in the business. Because of their enormous user base, BidRivals.com is able to stock their auctions with a lot of high-end merchandise. This is a major advantage over smaller penny auction sites, which may lack the financial leverage to do the same. All auctioned items are shipped immediately after the winning bidders pay the closing auction prices. They are sent by suppliers in Europe. If you live in the U.S., and win an auction, allow a couple of days for your product to arrive. You can also return products to the suppliers as long as they are undamaged and their original packages remain unopened. Expect the shipping costs to vary by product. This should not be a surprise since a large screen television will cost more to ship than an iPad. Below, you’ll find reviews and ratings left by real bidders regarding their experience at Bid Rivals. They offer valuable insight about the site. We can provide an exhaustive critique about Bid Rivals, but ratings and reviews from bidders who are currently bidding for products provide a unique context. If you have used BidRivals, we encourage you to take a moment to leave your own rating along with a few comments about your experience. They will prove valuable to others who visit this site for advice. Check out BidRivals has the latest technology. iPads, MacBooks, HDTV’s & More! BidRivals is down currently. The website says they are undergoing re-organization and maintenance. However this sounds like the end of BidRivals. I would bid elsewhere. Great site for computers and the latest electronics. They have the high end stuff up for grabs and offer BIN on the auctions. It’s like quibids but not as big or quite as competitive. I like that they have plenty of smaller auctions that you can play in with less risk.